The inaugural brainmassage session took place on August 10, with the woman behind ‘Aromatherapy with Sarah’. An advocate for natural therapies and the ‘low-tox’ lifestyle, Sarah Smart shared her knowledge of essential oils and their role in assisting with specific conditions. 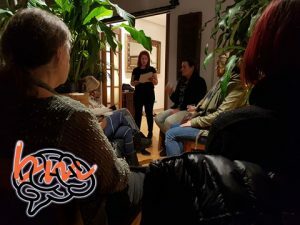 She outlined the differences between remedial massage and aromatherapy (“it’s gentler”) and how a session can (and always should) be customised for the client’s particular conditions and needs. A former IT executive, Sarah left all those bytes behind and switched to a different… read more. The next brainmassage session takes plave on Wednesday 14 September at 7PM – with bubbly and munchies. Learn more about brainmassage. Remember, it’s a free event!